The site where the Ark and the Dove landed, in 1634, belonged to the Yaocomico people. “…[I]n order to avoid every appearance of injustice and afford opportunity for hostility,” wrote a Jesuit priest who traveled on the Ark, “we bought from the King thirty miles of land.” There are different versions of what happened next. In one, the Yaocomico were planning to move anyway, and were happy to get food and supplies from the English before they left. In a second, the “king” mentioned by the priest was not of the Yaocomico tribe, but the chief of the larger Piscataway nation, who took the payment to chase the Yaocomico away. Since the “but they planned to move anyway” version of the story seems self serving and I’m a little cynical, my vote is for the second version. St. Mary’s City is a small college town in southern Maryland, about 2 hours from DC. It consists of the school – St. Mary’s College – and a living museum, Historic St. Mary’s City (HSMC). 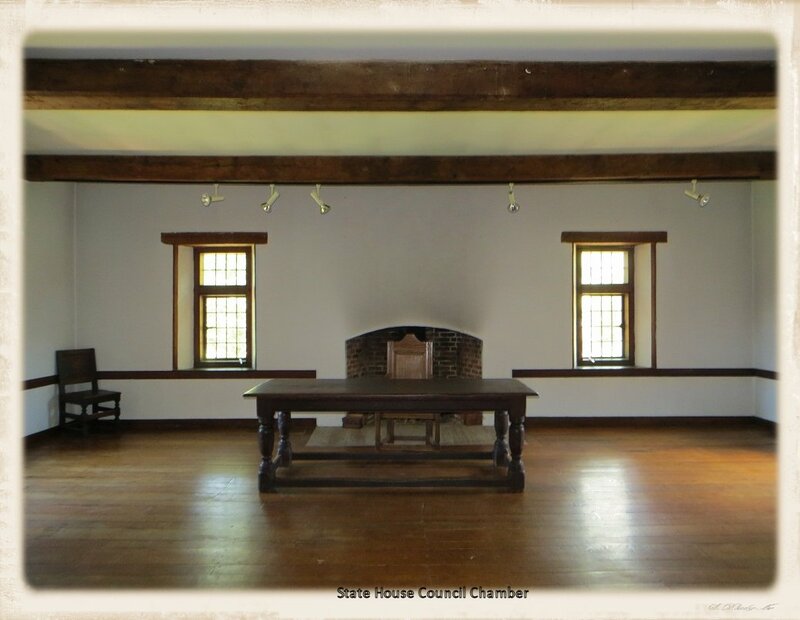 HSMC is a reconstruction, on the original foundations, of the 17th century town founded by the settlers who came on the Ark and the Dove. It was the fourth permanent English settlement in North America (after Jamestown, Plymouth, and New Netherlands). A path that starts at the the HSMC visitors’ center took us on a loop through the reconstructed settlement. Leaving the center, we took the right fork east, and came to a Yaocomico village about a hundred yards away. The entire settlement is self-guided, although there were costumed interpreters at each exhibit to provide general information and answer questions. 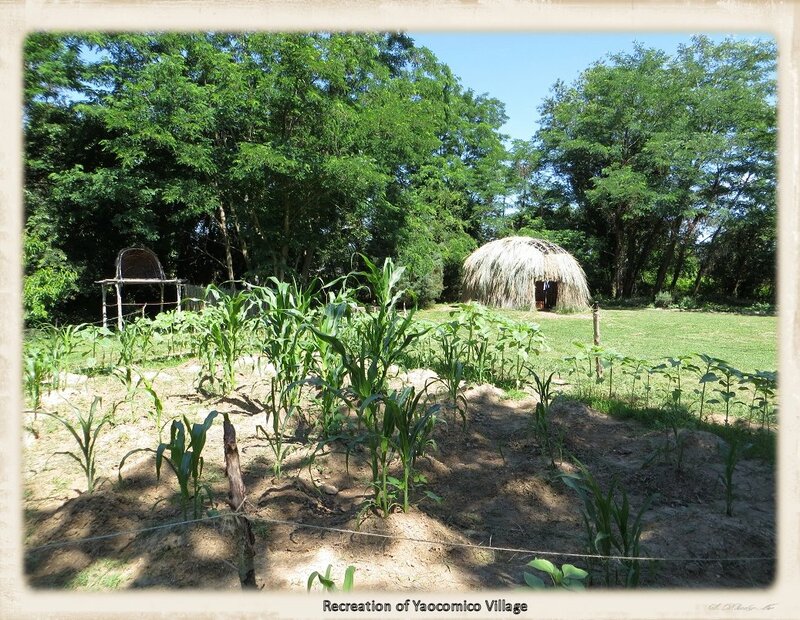 The ones at the village were not portraying Yaocomico, but English settlers after they took over the village. Good decision on the part of HSMC. Another hundred yards down the path and there was a reconstruction of a 1667 brick chapel. Maryland originally was owned by the Catholic Calvert family, who implemented a policy of religious tolerance – at least for Trinitarian Christians — in the state. That only lasted until 1704, by which time Anglicans were firmly back in rule in England. 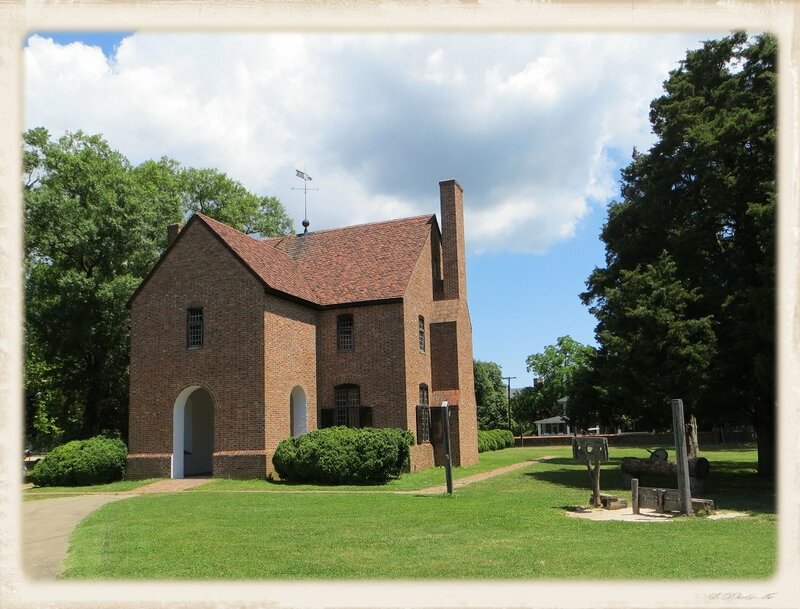 Maryland followed suit and Catholic churches and schools were outlawed, the brick chapel was locked, and Catholics (and the other substantial non-Anglican denomination, the Quakers) went underground until after the Revolution, when freedom of religion became the law of the land. The Catholics dismantled the chapel, leaving only the foundation, and used the materials elsewhere. Actually, they didn’t only leave the foundation. In 1990, three lead coffins were found buried under the foundation. The man, woman and child in the coffins are, they believe, Calverts. Next came downtown HSMC, with a store, a tavern and a print shop. We stopped at the store, where the interpreter told us about the bits of 17th century Facon-de-Venise glasses they had found. 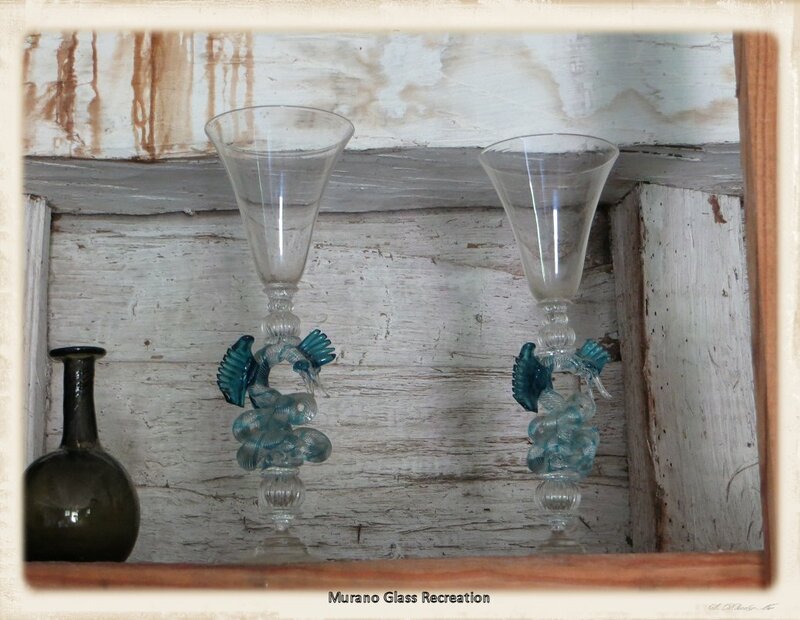 The same Murano factory that had made the original made the reproductions for HSMC pictured above. There were no reproductions in the gift shop (I looked) but you can still get the real thing: a 17th century Facon-de-Venise glass similar to HSMC’s sold at a Christie’s auction in 2010 for a little less than $6500. 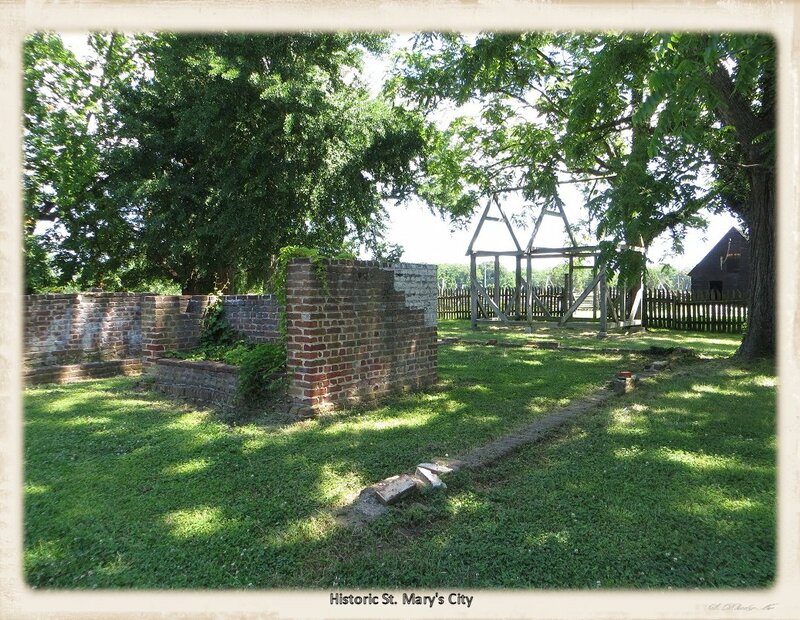 St. Mary’s City was the capitol of Maryland and a thriving town for 61 years, until the capitol was moved to Annapolis. Over the next 300 years, it disappeared into the ground and under tobacco, corn and wheat fields. 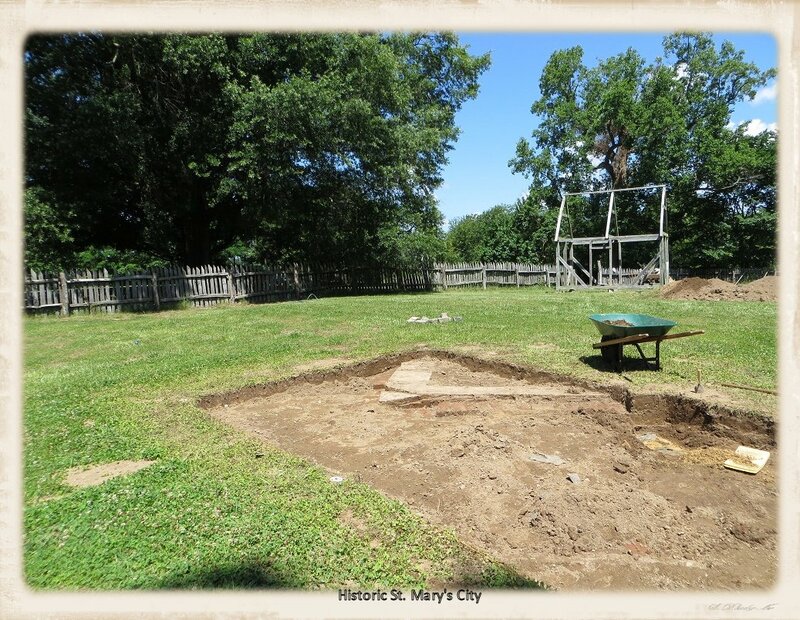 Informal digs began in the early 20th century, and HSMC began its formal archeology program in 1971. Students from St. Mary’s College archeological program work the dig, and are tasked to answer any questions visitors may have. The rebuilding of HSMC has barely begun, but there’s lots of evidence of future builds. Frames are up where they’ve found foundations and intend to construct buildings. 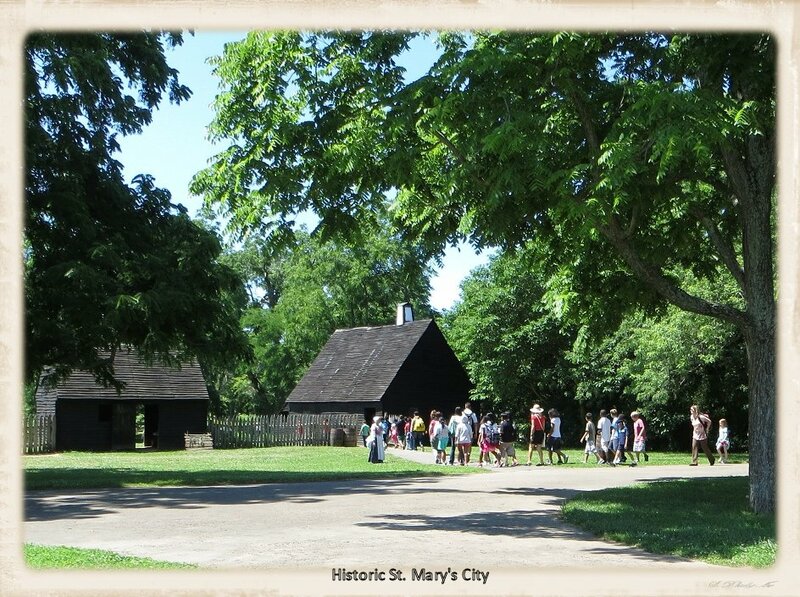 Garrett Van Sweringen’s inn was near the State House, and was the social center of 17th century St. Mary’s upper crust. They haven’t quite finished the inside of the building, but exhibits tell what will be where. At the far northern end of town is the 1676 State house, where the Maryland Assembly met until 1694. The county and provincial courts also met there. When the capitol moved to Annapolis, the State House was given to the local Anglican congregation, where they worshiped until the mid-1800s. 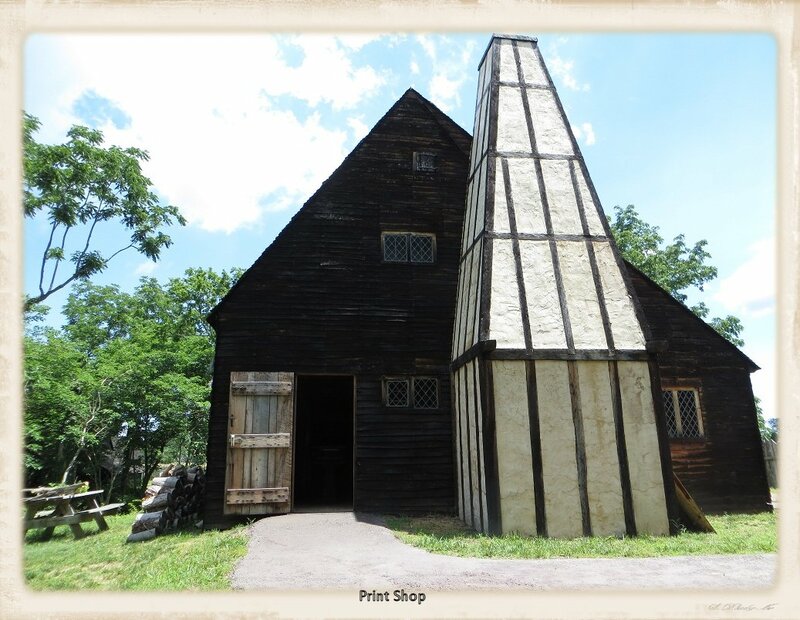 As we headed back to the visitors’ center parking lot, we stopped at the print shop that we had missed on the way through town center the first time. Lead type found during archeological digs showed that it was the location of the first printing press in America south of Boston. 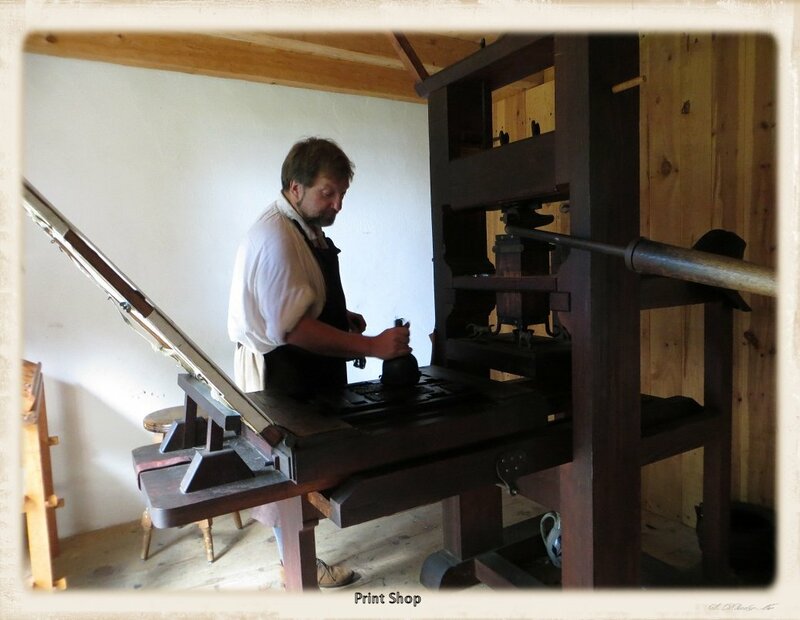 The printers were William Nuthead and his wife, Dinah, and their business mostly revolved around printing government forms for the Assembly. Business slowed when the Capitol moved to Annapolis, so when William died in 1695, Dinah packed up the printer and headed to Annapolis with it. There, she became the first licensed woman printer in America. Halfway through our day, we got hungry. Be warned that there is nowhere to eat at HSMC. St. Mary’s College adjoins HSMC and visitors are welcomed to use their cafeteria. We didn’t and satisfied ourselves with peanuts, cookies and a drink from a gift shop in one of the reconstructed buildings near the State House. The visitors’ center has a short movie and a small exhibit. The bulk of the HSMC artifact collection is housed at a separate facility, called the St. John’s Site Museum, on the edge of the St. Mary’s College campus. 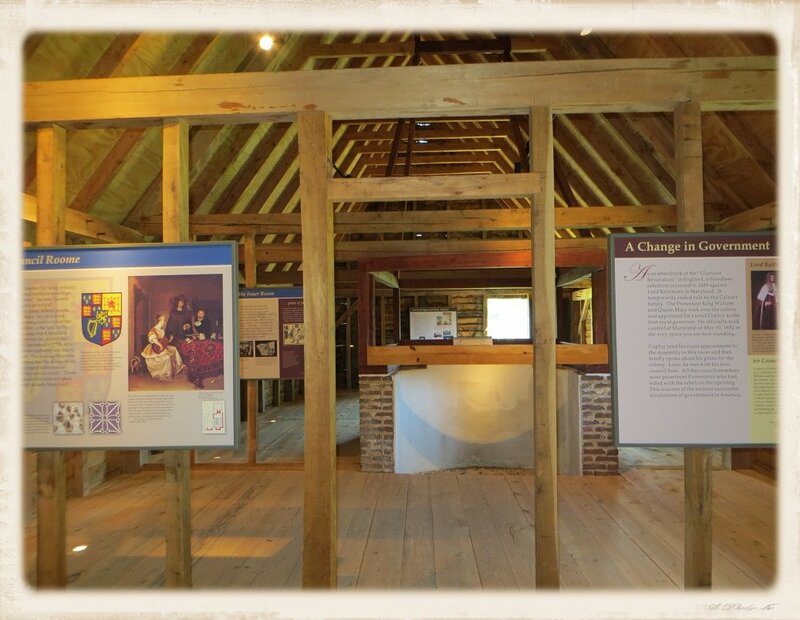 The St. John’s museum building is a reconstruction of the 1638 residence of Maryland’s first provincial secretary. It’s included in the HSMC ticket, but open only on Saturday and Sunday and only during the summer. We were there on a Thursday, so missed it. 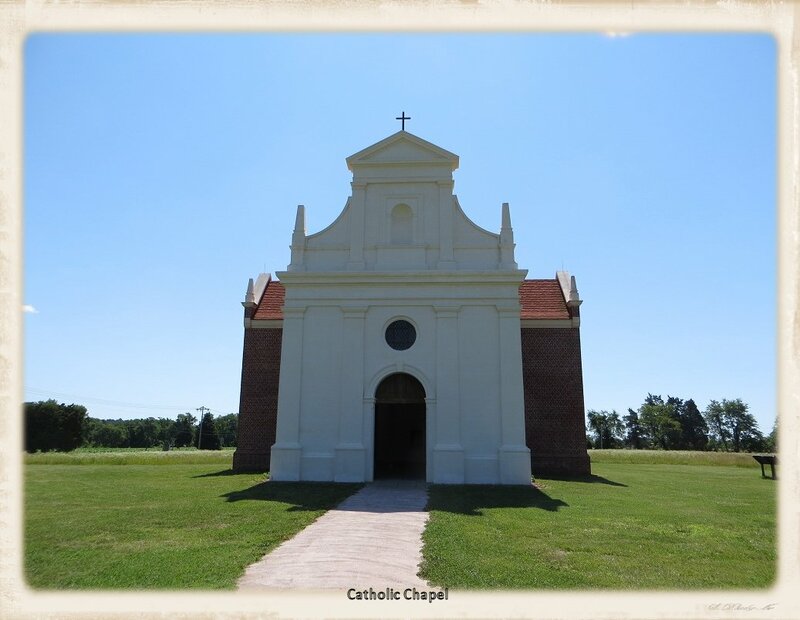 Gallery | This entry was posted in Maryland and tagged Ark and Dove, Calverts, Historic St. Mary's City, history, history travel, Maryland, Maryland Dove, Native Americans. Bookmark the permalink. Love that top photo, that house looks so light and airy. 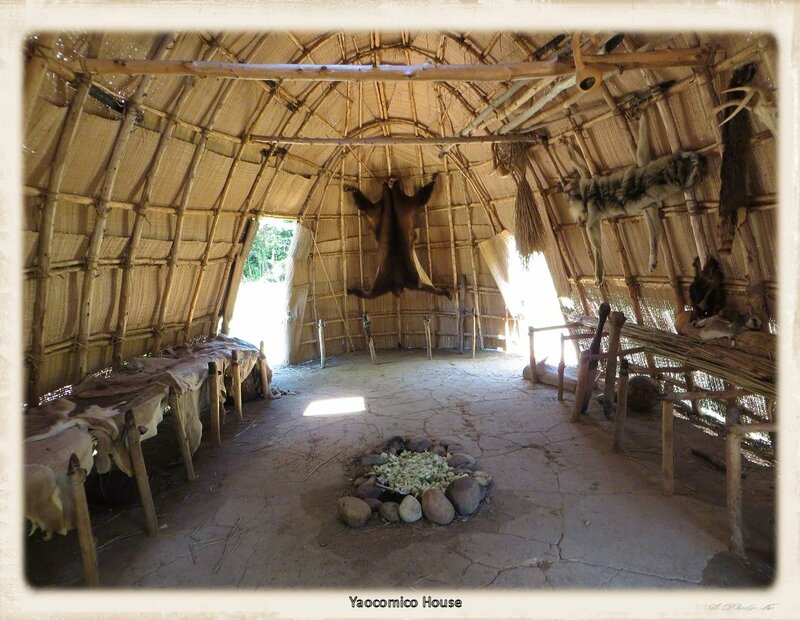 That seems to be the common style of house for Native Americans along the mid-Atlantic coast. We saw them used by different tribes on our Virginia trip. Very practical, I think.